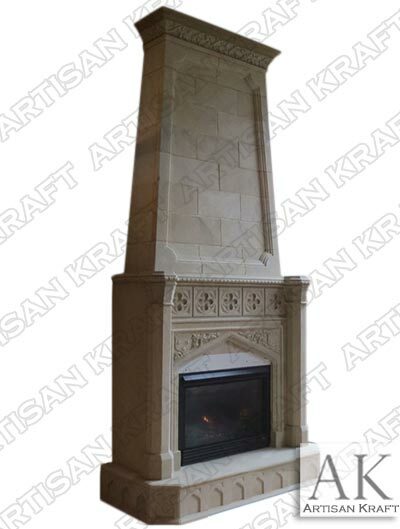 Large Overmantel Gothic Tudor Fireplace is the center piece of this Hall. This English design incorporates all the fines features of Tudor and Gothic surrounds. Starting from the floor the raised hearth with cut corners and peaked domes all customized. Two columns that end at the dental molding shelf. A peak above the firebox with custom medallions and leafing on each side. Above sits the upper mantel with a trayed in set frame. The detailed steps with half circle curves. The overmantel not only tapers up but it also tapers back a feat in both design and manufacturing. This all comes to an end at the top of the final shelf. This top shelf is in two parts the trim above and the leaf carvings below. The installation on a fireplace like this one is difficult and an expert installer is necessary. A carved mantel is only as fine as it is installed. Even if it was made well but installation was bad then the beauty will never be realized.